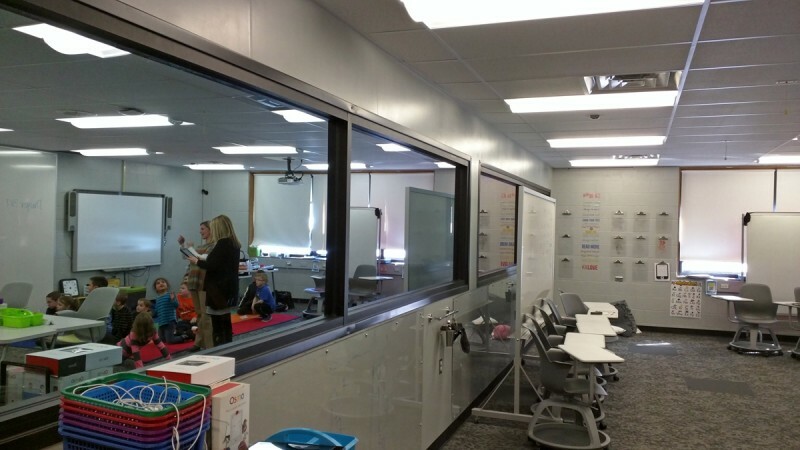 MENTOR, Ohio – A two-way mirror was a window to the classroom of the future. A kindergarten teacher worked with a small group of students. Other children worked independently throughout the rectangular room. Some held tablet computers with special devices to scan letter tiles. Some sat on the floor playing an educational game. Unnoticed by the children were the adults on the other side of the frosted glass windows that lined one wall. This is a laboratory classroom, offering teachers the space and training to test-drive new technology. Teachers from around the district bring their students here to try experimental lessons that blend in-person instruction and digital tools. The school district in Mentor, a working-class city in northeastern Ohio near Lake Erie, has committed to a plan that will require all teachers to use technology to enhance teaching and learning. As it is phased in, the project will mean creating new classroom designs that are influenced by the new learning style. The norms that most adults remember from their own school days — rows of desks facing a chalkboard, podiums for lectures — are being discarded to make way for soft seating, nooks for group meetings and desks on wheels. And, of course, computers everywhere. The ambitious plan has elevated the small district of about 7,700 students to national prominence. It fielded more than 100 requests to visit during this past school year, with some educators traveling to the suburbs of Cleveland from as far away as China. Related: Prove it: How does blended learning look in a classroom? And soon the district will be able to collaborate with people directly. Construction of a $4-million professional development center in Mentor neared completion this week. The training center, large enough to accommodate up to 500 teachers, will be open to school districts and community colleges in northeast Ohio wishing to learn how to use blended learning. 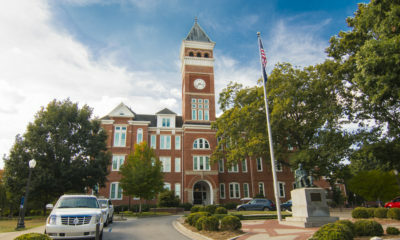 Called the Paradigm, the center was developed with the assistance of experts from North Carolina State University and the University of Maryland, and will be home to several programs related to high school-level digital learning, Miller said. School leaders across the nation say they are hampered by a shortage of educational technology training. A common challenge cited by K-12 educators is insecurity about their ability to effectively use technology and student data in the classroom, according to a survey released this week by the Software and Information Industry Association. “They all have this notion that everyone is ahead of them,” Karen Billings, vice president of the education division at the Software and Information Industry Association, said Tuesday in Philadelphia, during ISTE 2015, an annual educational technology conference. Educators in Mentor are trying to address this issue, but Miller emphasized that they do not have all the answers. They, too, are still trying to crack the code on digital learning. “If someone wants a template, we don’t have it,” he said. Still, the attention his district has received is testament to the growing demand for examples of how high-tech classrooms actually function in the messy reality of an ordinary school day. Schools feel pressure to move quickly enough to adopt new technology while it is still relevant; at the same time, they must avoid costly mistakes. Last year’s high-profile flop of a $1.3 billion iPad program in the Los Angeles Unified School District, the country’s second largest, showed that failures can be expensive and time-consuming. A U.S. Department of Education review, released late last year, suggested that inadequate negotiations with technology vendors and insufficient teacher preparation contributed to the program’s implosion. In Mentor, visiting observers can see a blended learning program in the planning process, not yet fully hatched. Some themes have emerged. The standard teacher’s lecture is discouraged; collaborative projects and more student choice in learning styles are favored. Blended learning – a mix of teacher-led and online instruction – is used to give students control over the pace of learning, give children more choice in how they learn or to deliver lessons that are custom-fit to each student’s level. Districts leaders say all Mentor teachers will get the training and space they need to figure out what works on a small scale, before they use blended learning in every classroom. By the next school year, all Mentor high school students are scheduled to have district-issued laptop computers. 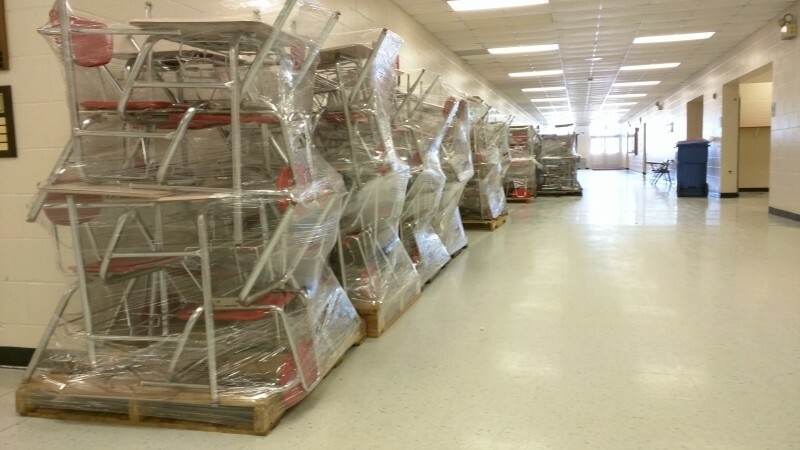 New classroom furniture should be in place, including wheeled desks and tables to make changing configurations easy. The library, which is already finished, features places to meet in small groups. It’s too soon to say if the changes at Mentor will improve academic achievement. Like many public school districts nationwide, Mentor has a growing number of low-income students, who tend to score lower on math and reading tests. The district superintendent says increased access to classroom technology will increase these students’ chances of succeeding in a world that demands technological fluency. The classroom with the two-way mirror, called the Catalyst, is located in Ridge Middle School, which also was home to a small test-run of blended learning. About 150 seventh-grade students took part in the pilot, but that was too small a group to draw conclusions – good or bad. In that middle school, two of every seven students come from economically challenged homes; overall they had mixed results on state tests of academic achievement, but there were slight gains in math scores for students in the blended learning program. Expanding and improving this program requires a lot of planning by district administrators. Teachers are expected to help craft those plans, by designing and testing experimental lessons. The laboratory classroom at Catalyst provides dedicated support for all the district’s teachers at various grade levels. Teachers and their students take a bus here during the regular school day. A district educator, called a “coach,” supports the teacher and offer suggestions for improvement. Together, they craft and try out new lessons in a classroom specially designed for this style of instruction. No one expects immediate success. Among the lessons learned is how to best cope with technology snafus that arise when 20 or more children are using a digital device. Teachers who spend too long trouble-shooting locked screens or misunderstood directions lose precious teaching time. Mentor teachers discovered a solution: Encourage children to work it out before approaching an adult for help. This worked. Even the youngest students adapted, educators said, and learned to rely on themselves and peers to solve technical problems. “Sometimes we don’t give students enough credit,” said Megan Kinsey, principal of Ridge Middle School. Even before the new trends in computer-assisted teaching, research had been done on the best classroom designs. Mentor’s leaders say they are using it to guide them. For instance, Kinsey insists that teachers carefully choose each thing selected for display on a classroom wall. This guidance is based on research that shows plastering every corner of a room with posters, charts and decorations can distract students from learning. “These are learning spaces, not living rooms,” Kinsey said. How to best accommodate new technology in classroom designs is still being investigated. Some say a flexible design that allows teachers to quickly shift to new furniture arrangements can facilitate blended learning. 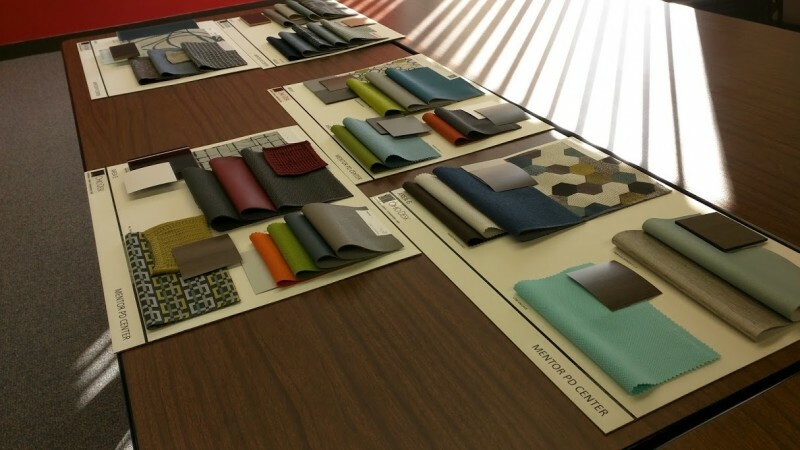 Businesses that specialize in classroom furniture are producing new models of desks, chairs and tables with digital learning in mind (even mundane items, such as cost-effective ways to allow students to plug in and charge their devices). Mentor is just one example of a school that is remodeling classrooms as part of its blended learning program. A charter school in Chicago opened a building dubbed the “first” school designed specifically to facilitate blended learning. A network of charter schools based in California and the state of Washington is known for buying low-cost furniture from Ikea. And, more controversially, some schools feature cubical-style workstations for students that are frequently described as similar to a telemarketing call-center. Mentor’s redesign project is fueled, in part, by a $13.8 million grant from the state of Ohio. The district partnered with a neighboring district to share resources as they transition to a new school model that relies on digital learning. To make this shift work, Mentor teachers were given a role in designing the plan. 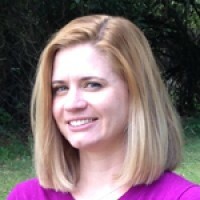 Jaclyn Nemes, a high school social studies teacher, was among the early adopters. For her classroom, she picked long tables where students will work on projects together using digital resources such as video. She expects to go to a paperless classroom soon. And she’s experimenting with new applications on her computer and smartphone. It’s a lot of work. This story was written by The Hechinger Report, a nonprofit, independent news organization focused on inequality and innovation in education. Sign up for our newsletter to get a weekly update on blended learning.